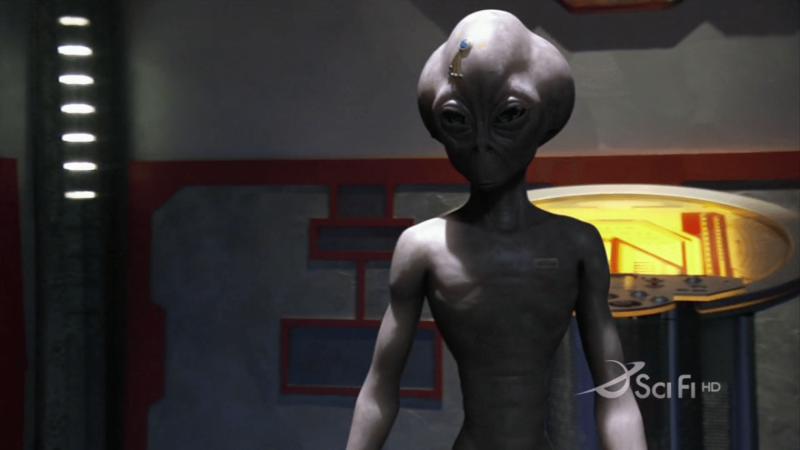 Yesterday I wrote about the lack of evidence for extraterrestrial intelligence. While there are lots of possible reasons why such evidence isn’t forthcoming, the seeming abundance of potentially habitable worlds in the cosmos seems to raise an interesting paradox. It is often known as the Fermi paradox, and can be basically stated as a question. Given the high number of potentially habitable worlds, and the apparent ease of life’s appearance on Earth, why haven’t we been contacted by alien civilizations? While there are lots of possible solutions to the paradox, one increasingly popular idea is known as the great filter. The idea was first proposed by Robin Hanson in 1998. 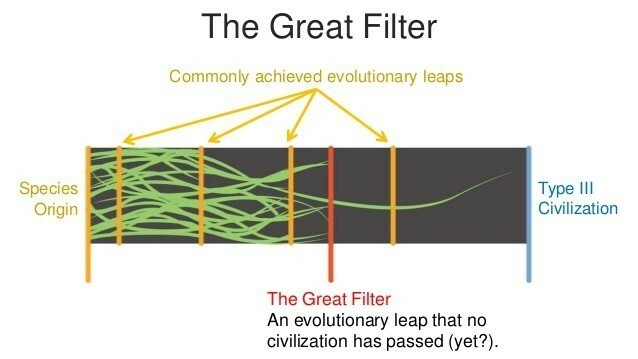 On the face of it, the great filter is a simple argument: somewhere along the way from the first appearance of life to great star-faring civilization, there could be some extremely difficult evolutionary threshold. Every other stage might be easy, but a single, nearly impossible leap forward could act as a “great filter” to prevent many great civilizations from appearing. Where it gets interesting is when you consider what such a great filter might be. 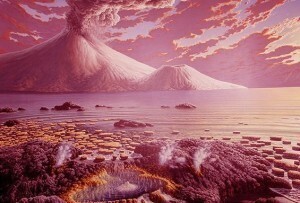 If the great filter is early in the development of life, such as the appearance of eukaryotes (cells with a nucleus enclosed in a membrane), then complex life in general could be extremely rare. We might find simple organisms similar to bacteria on other worlds, but nothing as complex as a flatworm, much less a truly intelligent species. In that case the filter would be long behind us, and the galaxy could be open to us alone. On the other hand, it could be that complex life and intelligence is easy, but making the transition to a star-faring species is difficult. Perhaps any civilization capable of large industry, nuclear power and rockets usually destroys itself by poisoning its planet or stripping it bare of resources. In that case the great filter could be ahead of us, and we are likely doomed. If we found complex and somewhat intelligent organism on Europa, for example, it could suggest our great filter is yet to come. Of course there might also be several great filters, and passing one is no guarantee that we’ll pass others. It’s an interesting speculation, but at this point we simply don’t have enough evidence to test the idea, much less argue in favor of one scenario over the other. But it raise an important point. Evolutionary history is very clear about the fact that long term success is not guaranteed. The history of life on Earth is filled with once successful extinct species. Our supremacy of the planet buys us nothing in the long term. For example, yeast in a batch of homebrew flourishes for a time before the available sugars are consumed and they poison themselves with their alcoholic waste. We too could flourish for a time before a great die off. The difference is that we are capable of seeing potential risks and planning accordingly. Our intelligence and ability to adapt to change is one of humanities greatest strengths. If a great filter does lie in our future, hopefully we will be up to the challenge. It is more than just probable that intelligent star-faring civilizations in the same galaxy would simply “miss” each other. After all, there are time limits and speed limits. For sun sized main sequence stars, the time limit is, perhaps 10 billion years to evolve. Chance of that? 1 in millions or less. The speed limit, of course is c. That just makes communication, not to mention rendezvous an intractable problem. One is tempted to think the universe is designed that way. The distances are TOO GREAT. They are out there. How many? I do not know. But SOME life is out there. Did they visit US? Who knows? They may be so advanced they are invisible. This made me think about global warming. When I was a kid and went to school then my teacher was talking about global warming. He said humanity does everything for it to happen but it doesn’t happen (yet). So there was a prediction of the human influence more then 30 years ago. Then, after years, we could see it happen. So the prediction became real. Now we can predict what certain levels of global warming will do to the planet. But what is humanity doing these days? Increasing its carbon footprint by the year even though we know this has the chance to cause incredible damage to our species. That makes me believe that we are rather of the ending branches of the evolution tree of all civilizations out there. While we have undoubtedly achieved a lot – we might be far less intelligent as a species then we would like to think. I can see you read the article on “Wait but Why” about the great filters. It’s a really cool article, and I like how it concludes. Whatever the answer turns out to be for the Fermi paradox, it is mind-blowing. There’s no “boring” answer to it. Mr. Koberlein, if you would please dare to briefly digress (from what is known or suspected scientifically), what are your gut feelings and thoughts regarding the present existence (or potential) of extraterrestrial life; and further, on the development/existence of extraterrestrial consciousness/awareness/intelligence?